NEW YORK—The ensemble finished the last note of the Scherzo Allegro movement of Brahm’s Piano Quintet in F minor with resounding energy at the very moment when the violist’s string snapped from the verve. The Gustav Mahler String Quartet’s ability to play with such power was what made the June 1 performance at Carnegie Hall so distinct. The quartet maintained their incredible vigor, even during the softer and slower movements. They played with a particular beauty, one that only comes when there is an intrinsic unity between musicians with genuine passion. 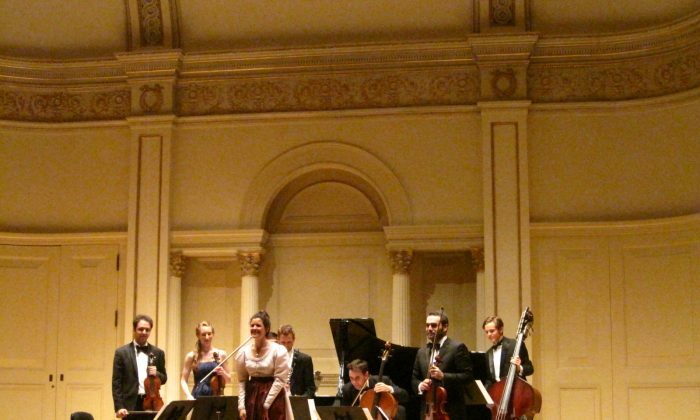 The ensemble was a part of the Mahler Philharmonic, a nonprofit society of musicians and artists based in Vienna. It was founded by Thérèse Mahler, a descendent of the late-Romantic Austrian composer Gustav Mahler. She also happens to be a brilliant lyric dramatic mezzo-soprano, and performed as the vocalist of the evening for Mahler’s Rückert-Lieder. Ms. Mahler sang beautifully and heartily, and looked incredibly thoughtful as she did it. There are some singers who are aware that they sound good while they perform, but there was nothing self-ingratiating about Mahler’s stage presence. There was a rare purity in her voice and her emotions. It seemed that she was completely giving herself away to the history and the story behind the lyrics. Thérèse Mahler was giving her all to the spirit of Mahler. But Mahler’s wasn’t the only spirit these musicians captured. The group also played Beethoven’s “Grosse Fuge” in B-flat Major, op. 133. The first chord was stretched to its fullest potential for grandeur, leaving a profound silence as the ensemble counted the rests in their hearts. New York had just transitioned from extreme temperatures, and it seemed that several audience members were sick. But all coughs and sniffles were stifled during this powerful moment of silence. The ensemble came in again with immaculate unison. They went on to play with an emotional strength that not only captured Beethoven’s rage but also the part of him that loved tenderly. The performance also included Brahm’s Piano Quintet in F minor, op. 34. It was Jesús Rodolfo Rodriguez’s string that broke after the Allegro. Rodriguez was the principal violist for the Mahler Philharmonic. He has previously performed with Itzhak Perlman and Pinchas Zukerman, and has won the 2013 Mannes College of Music Concerto Competition. There was a consummate grace in his tone, one that resounded with the same brightness as a violin during high notes, as well as the same melancholy of a cello during lower ones. After a moment of collected laughter, Rodriguez’s facial expression swiftly switched to a natural and solemn demeanor as he anticipated the haunting beauty of the finale. Of course, the concert ended with a few Mahler pieces. The ensemble played Mahler’s 5th Symphony, Piano Quartet in A minor, and accompanied the soprano in Rückert -Lieder. Quartet members included Jesús Reina, the first concertmaster of the Mahler Philharmonic. He has been a soloist with Pinchas Zukerman and Itzhak Perlman as well. The principal associate concertmaster was Anna Margrethe Nilsen, who studies with Pinchas Zukerman and went to the Manhattan School of Music and the Norwegian Academy of Music. The cellist in the ensemble was Andrew Janss, who graduated from the Manhattan School of Music and has performed with Itzhak Perlman, Pinchas Zukerman, and Kim Kashkashian.